The labbits are thrilled to be getting summer squash, onions, tomatoes, scallions and zucchini from Deep Meadow Farm, their local CSA, and a regular booth at the Bellows Falls Friday Farmer's Market. 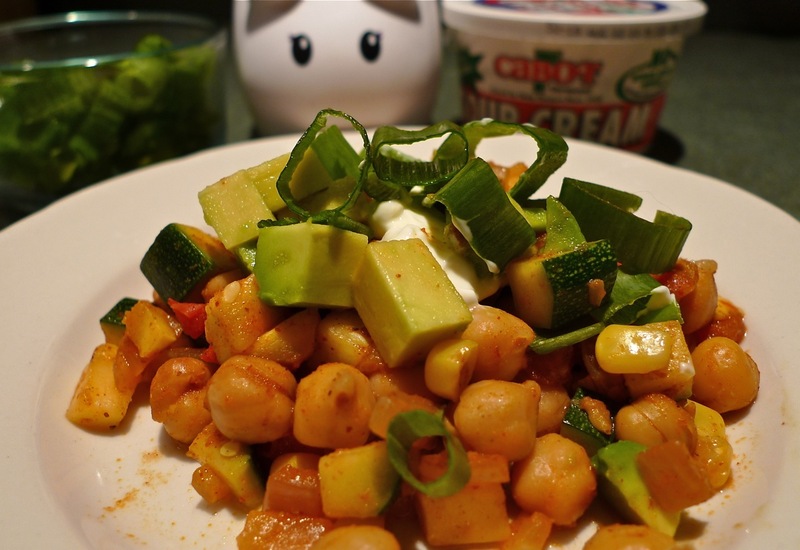 It's too bad that corn isn't in season yet, but Clover cheated a little and threw in some cooked up frozen corn into the pot, along with some chickpeas (from a can), and then served it up with chopped scallions, diced avocado and a dollop of sour cream. The only problem is, Clover has no idea what to call this dish. Is it a chili? It seems not soupy enough to be chili. Is it a goulash (which, according to Clover's friend Maggie Whalebutt, has onions and paprika) or is it not "stewey" enough? Is it a salsa? Served cold with some Red Hot Blues it's a fantastic salsa. It could also be served cold as a leafless salad, thinking along the lines of other leafless salads like bean salad or potato salad. Whatever you decide to call it, it's a delicious way to celebrate the harvest of seasonal summer veggies. Print the recipe here. Heat the oil in a large pan over medium heat. Add the onion and garlic and saute for a minute, stirring constantly. Add the zucchini, summer squash, corn, chickpeas, tomatoes, and spices and cook, stirring frequently, until the tomatoes have softened but the summer squash is still crisp, about 3 or 4 minutes. Serve hot with a spoonful of sour cream, a sprinkling of chopped scallions and a generous helping of diced avocado, with tortilla chips on the side. You can also serve this cold like a salsa. 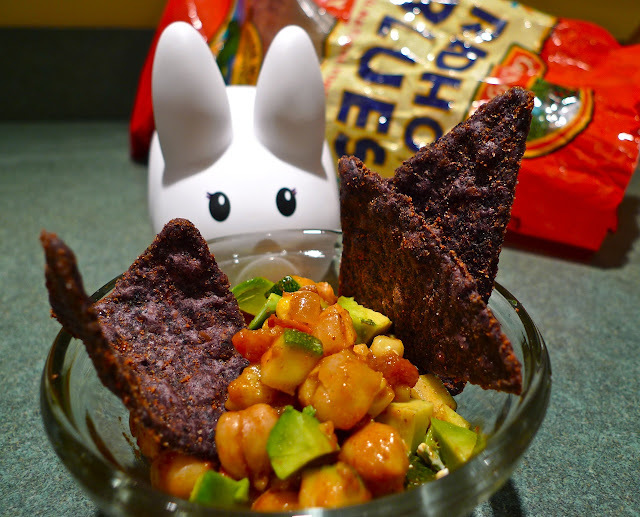 Serves: 4 labbits as a main; several labbits as a salsa.